Scribes & Vibes Third Sunday of the MonthLocation(s): Ritz Theater & Museum The Historic Ritz Theater & Museum presents poetry, jazz and BRUNCH the third Sunday of each month. 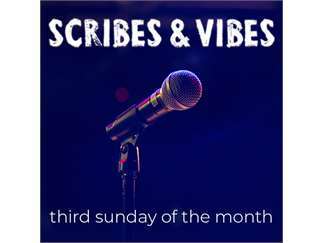 Scribes & Vibes is a place for Jacksonville’s talent to showcase their poetry and spoken word skills while enjoying an afternoon brunch. The shows hosted by award-winning poet Rahman Johnson brings DJ Al Pete and songstress Akia Uwanda to the stage for an afternoon of poetry, Jazz, and elegance. Scribes & Vibes happens each third Sunday 11am – 4pm in the lobby of the Ritz.event Dates:Sunday, February 17, 2019 | 11:00 a.m. - 4:00 p.m.Sunday, March 17, 2019 | 11:00 a.m. - 4:00 p.m. Sunday, April Sunday, June 16, 2019 | 11:00 a.m. - 4:00 p.m.Sunday, July 21, 2019 | 11:00 a.m. - 4:00 p.m.Sunday, August 18, 2019 | 11:00 a.m. - 4:00 p.m.Sunday, September 15, 2019 | 11:00 a.m. - 4:00 p.m.Sunday, October 20, 2019 | 11:00 a.m. - 4:00 p.m.Sunday, November 17, 2019 | 11:00 a.m. - 4:00 p.m.Sunday, December 15, 2019 | 11:00 a.m. - 4:00 p.m.